No weight class in the UFC is more maligned than the light heavyweight division. Some, like all four women’s divisions, don’t get as much love as they should. Others, like the men’s flyweight ranks, get knocked because the Average Joes who watch UFC events think there is something less entertaining or exciting about skilled fighters who are smaller than they are showcasing their abundant talents to be inside the Octagon. But if there is one that is universally lamented, it’s the light heavyweight division. Once the glamour division — not only in the UFC, but arguably the sport — and home to some of the most iconic names to ever grace the Octagon, the 205-pound weight class has been mired in a funk for the last several years. Jon Jones has been suspended more times than he’s fought. Daniel Cormier has dominated in Jones’s absence, but faltered in his presence. Alexander Gustafsson has remained the third wheel, waiting for his chance to face one of the two perennial titleholders while battling his own injuries. 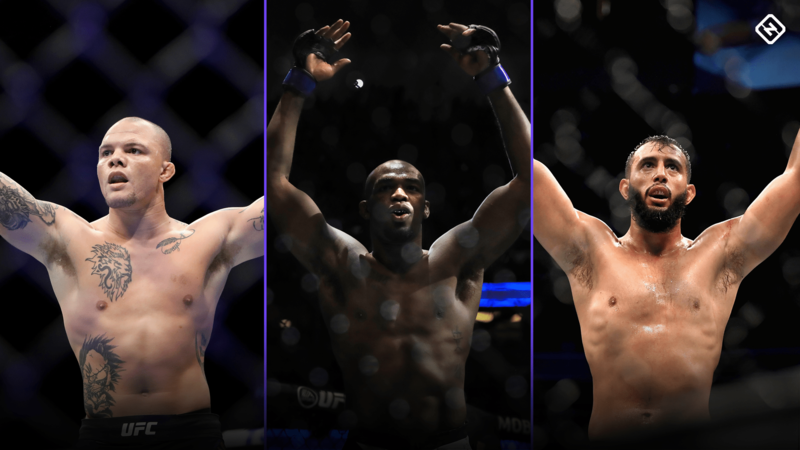 Whenever conversations shifted to the light heavyweight division, it was met with a sigh — a verbal acknowledgment of the staleness that comes with talking about a weight class that once regularly produced Fight of the Year contenders and has seemingly become a division divided into the upper-tier triumvirate of Jones, Cormier and Gustafsson, with everyone else trailing far behind. And while there have always been sturdy, talented, veteran competitors jockeying for position behind that troika, none have really managed to turn that group into a quartet or a five-piece. Instead, they’ve traded wins and losses amongst themselves, playing musical chairs in positions three through 10 in the rankings; the order always changing, but the names remaining the same. Compounding things was the fact that few new names appeared on the horizon and the ones that did show up often failed to make a serious dent. Even when they did — like when Volkan Oezdemir posted three straight victories over Top 10 opponents in six months last year to emerge as a contender — few saw them as real threats because the gap between the top tier and everyone else was vast and climbing the divisional ladder without beating one of them was perceived as a somewhat hollow ascent. But it feels like that is changing and the final 10 weeks of 2018 have the potential to help reshape the way people look at the light heavyweight ranks and create some drama and intrigue in the division heading into next year. A few weeks ago in Las Vegas, Dominick Reyes proved that he’s deserving of inclusion in the pack of fighters two steps behind the championship trio by outworking Ovince Saint Preux to earn his fourth straight UFC victory and 10th consecutive win overall. A former collegiate defensive back, “The Devastator” is a fluid, powerful athlete with no experience against the division’s established names and an undefined ceiling, which makes him something of a rarity in the weight class in recent years. This week in Moncton, New Brunswick, Canada, Oezdemir will serve as a stern test for Anthony Smith, a former middleweight journeyman who has impressed with rapid first-round stoppage wins over former champions Rashad Evans and Shogun Rua since transitioning to the division, but whose place in the hierarchy is still undefined. Regardless of the outcome of Saturday’s main event, Oezdemir or Smith will have proven himself worthy of Top 5 consideration. Before the Maritimes main event hits the cage, Misha Cirkunov returns to take on entrenched veteran Patrick Cummins in another crucial contest in the 205-pound ranks. Once tagged as a rising star in the division, the Latvian-born Canadian, who relocated to Las Vegas prior to this camp, hit a rough patch in 2017 as losses to Oezdemir and Glover Teixeira took some shine off his star. But the standout grappler had won eight straight prior to hitting the skids and wouldn’t be the first (or last) fighter to need to suffer a couple understandable losses in order to change things up and start making a charge towards the top of the division. November features the organizational debuts of Alonzo Menifield and Jim Crute, a pair of undefeated Contender Series alums poised to take a serious step up in competition, and the return of Khalil Rountree, the former highly regarded prospect and TUF finalist, who opened a lot of eyes with his 96-second knockout win over kickboxing star Gokhan Saki at UFC 226. Menifield is 31, Rountree is 28 and Crute is the baby of the bunch at just 22-years-old. All three have shown flashes of potential that make them worth watching, both next month and into next year. UFC 231 offers two more compelling contests in the light heavyweight ranks, beginning with an intriguing pairing between 28-year-old American Devin Clark and 26-year-old Austrian Aleksandar Rakic, two relatively young fighters looking to garner greater momentum heading into 2019. They’ll be followed by the rescheduled clash between Top 10 fixture Jimi Manuwa and Thiago “Marreta” Santos, a former middleweight powerhouse who stopped Smith earlier this year and is now looking to follow the same path to contention “Lionheart” is currently blazing in their new division. Three weeks later, Ilir Latifi and Corey Anderson meet in a clash of divisional stalwarts, both of whom are looking to extend their winning streaks to three and solidify their place in the divisional hierarchy before Jones and Gustafsson finally face off for a second time, five years after their instant classic at UFC 165 in Toronto, with the vacant light heavyweight title hanging in the balance. After three chaotic years with Cormier standing atop the division in Jones’s absence, “DC” is stepping aside to focus on fighting at heavyweight and wrapping up his career, creating a situation where the last fight of 2018 will crown a new light heavyweight champion and establish whom everyone will be chasing next year. And for the first time in a long time, there are new names climbing the ladder, ready to compete alongside the division’s established veteran class, with even more promising fresh faces not far behind. While it will never get back to being the astounding collection of luminaries it was when the title was passed from Liddell to Jackson to Griffin to Evans to Machida to Rua and onto Jones, who then rattled off one of the most impressive eight-fight winning streaks this sport has ever seen before beating himself multiple times, giving rise to Cormier’s underappreciated run at the top, the light heavyweight division is poised to make a serious comeback in 2019. And the groundwork for it is being laid over these next 10 weeks. Established contenders will solidify their standing and new ones will announce their presence, all while the next wave of potential threats will introduce themselves to a larger audience. Pay close attention now, because many of the fighters everyone will be talking about at light heavyweight next year and beyond are about to hit the Octagon in the next three months. And there is no reason to pass up watching the UFC’s former glamor division begin its return to prominence.